Any Phone System stuff we want to do on our Microsoft Teams tenancy needs to be actioned via PowerShell. In fact, probably all of Teams administration can be done via Powershell. This posts gives us a quick view to get it all sorted – this example is being performed on a Windows 10 machine. 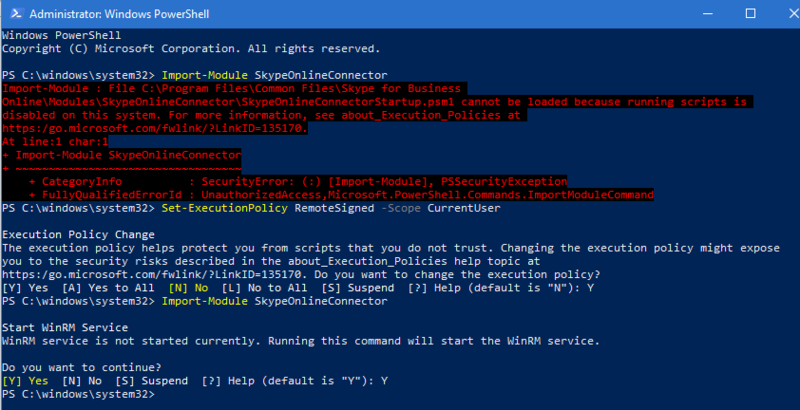 If you’ve encountered this, changing the ExecutionPolicy allows us to import the module. After you’ve loaded the SkypeOnlineConnector Module, we need to load the MicrosoftTeams module. Answer ‘Y’ to the prompts to install the module, then we need to open a session to Office365 – to do that we first need some login credentials. Enter in your account information for your O365 Admin portal. Done! you’re connected to your Office 365 tenancy, and you can now make changes. If you are looking to make a make Phone System changes, in particular add an SBC to your tenancy – I’ll go over that in my next post, for now have a look at some of the PSTN commands we’ll be using.